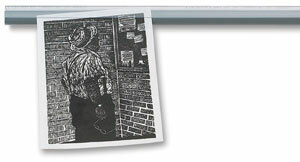 The Ghent Hold Up Display Rail is a creative and safe solution for hanging artwork and memos. There is no need for tape, tacks, or push pins. The rail grips thick and thin items, and papers slide in or out without tearing. A clear front lets the entire paper show through. Attaches with screws or double-sided tape.